For my simploring tour on Thursday, June 21st, I selected San Monique. 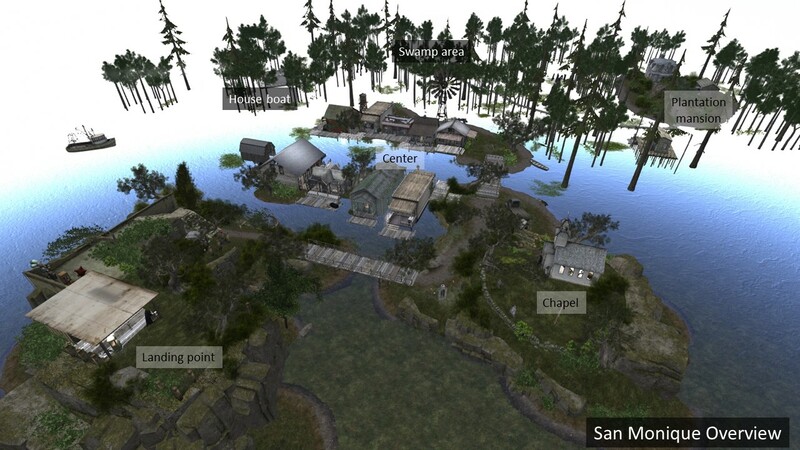 Inara Pey wrote an excellent report about San Monique in her blog “A touch of Live and Let Die in Second Life“, that tempted me to visit it myself. San Monique is a fictional Caribbean island and besides New Orleans one of the major sites of the plot of the James Bond film “Live and let die” from 1973. 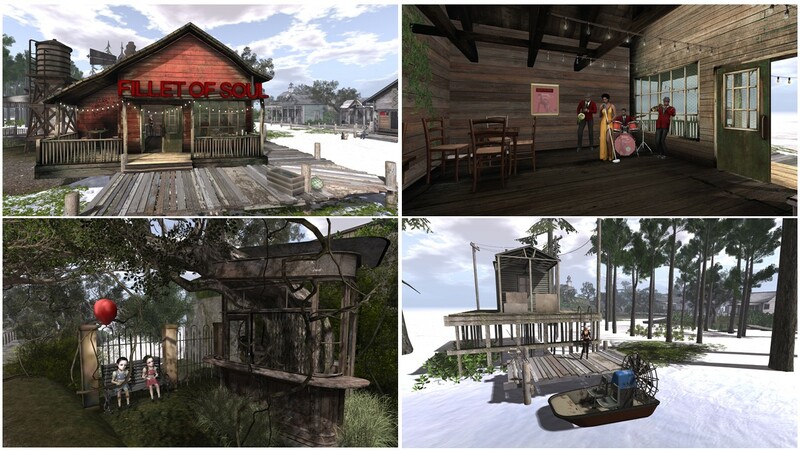 In Second life Zakk Lusch and They Wray DoneAway (They Ellisson) created a sim with a touch of New Orleans and the Bayou region of Louisiana. At San Monique you’ll find a lot of elements and references to the Bond film, be it the restaurant “Fillet of Soul” or the skull and top hat on a grave that are a reference to Baron Samedi. You’ll find some crocodiles and airboats and many more little details that hint to the film. For those not familiar with the film “Live and let die” or those who don’t remember it anymore in detail like myself, I recommend to read about the plot in wikipedia. But San Monique is not just about the Bond film. It is a beautiful and picturesque island in an extraordinairy style, not Mediterrean but Bayou. The center with the houses built above the water with the wooden board walks looks like being from another time and has a morbid charme. 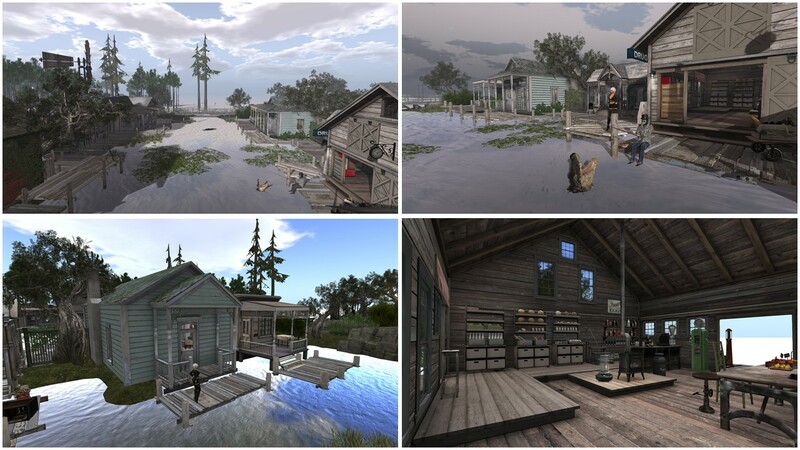 You can walk over wooden pathways into the swamps and over to an old plantage villa. I liked in particular the long driveway with the alley leading to the villa, that reminded me of the driveway in the film “Gone with the wind”. The villa itself has become shabby and again adds to the morbide charme of San Monique. Exploring San Monique you encounter several persons, like the fisherman in the center, two childs sitting on a bench next to the ruins of a fun park, a clown, a band playing in the restaurant “Fillet of Soul” or the two pallbearer at the archway leaging to the chapel. Often these persons greet you in main chat and they liven up the scenery. I also took some pictures posing next to crocodiles or fishing and I enjoyed exploring the swamps totally riskless and safe. San Monique is really unique. Thank you Zakk and They for creating this gem and providing it to the public for us all to enjoy.